If you have severe gum disease known as periodontitis, you may have lost some of the bone that holds your teeth in place. 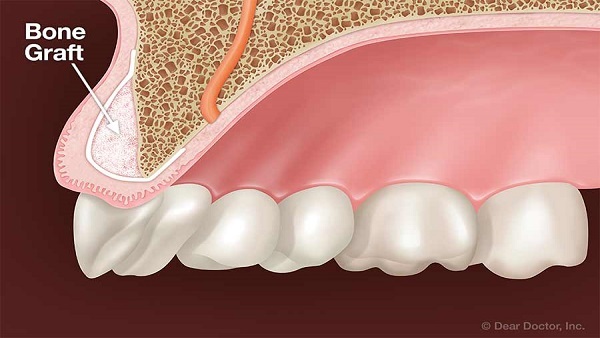 Bone grafts can help grow new bone to replace the bone destroyed by periodontitis. During the procedure, part of the gum will be folded back to clean out any infected gum tissue, bacteria covered calculus and rough tooth surfaces that can make gum disease worse. Then bone graft material is placed,which works with the body to help build new bone. Bone grafts can repair damage from gum disease and may boost the chances of keeping your teeth. When tooth loss has already occurred, a metal post can be inserted into the jaw bone to act as an artificial tooth root. This requires strong and ample bone to forma stable base. If there is not enough bone present, a bone graft is needed before you can get an implant. In bone grafting, a piece of bone is removed from another part of your jaw or your body, such as your hip, and transplanted to your jawbone.Frequently, commercially available artificial bone is also used. It will take several months for the transplanted bone to be ready for a dental implant.New bone growth will eventually replace the graft material.